We had the most bee sightings yet today. 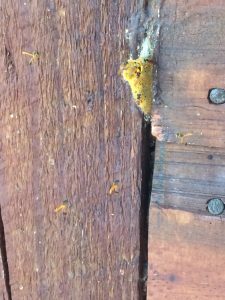 Sweat bees, Carpenter bees, Honey bees, and Stingless bees. 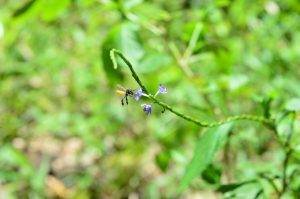 Carpenter bee was spotted during noon near muddy water on the Maya Trail. Its behavior was interesting in that it did not seem to be pollinating bees but was sensing around the dirt where it was moist but not covered in water. Its large size and distinct, loud buzzing sound cannot be mistaken. Unfortunately, this species of Carpenter bee was not included in my taxon id card, which only had one Carpenter bee species. Pictures will have to suffice for now. The Honey bee and Stingless bees were the only ones observed pollinating and feeding from flowers. During an off-trail hike, there was a 6 feet tall flowering tree that was surrounded by Honey and Stingless bees. Although others were super afraid, turning around asking me to check if a bee was on them, I could only zoom in with my body and camera to get the best possible picture of the Honey bee. However, the most involved encounters we had today with bees were with the Sweat bees who liked to land on human body for salt consumption. While entering an off-trail path, could hear students and a professor scream out that they had bees on them. As a bee specialist of the group, I really had no fears. Because I had known that around the region were these small (2-3 inches) ant-hill-looking structures on the ground were evidence of bee burrowing, I knew that they were surrounded by Sweat bees and not killer bees (the Africanized Wester Honey bee being the killer bee of this region). 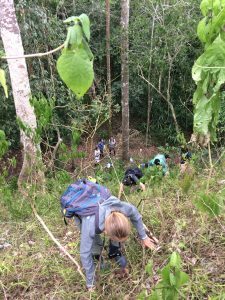 If they were indeed killer bees that landed on my fellow tropical field biologists, it was likely that they would have stung them and I would have heard painful screams – we are not a quiet crowd, as the later boa constrictor incident shows. These are not very social bees, although they live in small communities that are mostly made up of a single family. Most mounds house fewer than 10 bees, compared to the tens of thousands of bees some beehives contain. Other cool animal encounters had to do with a boa constrictor, a super large (15ft+) leaf-cutter ant hill, and unidentified nymphs that Claire decided to bring back to the station to ask others, including the locals here, and no one could tell us what it was. DAY 15 – I woke up this morning as the sun was rising in Belize and am now heading to bed in the United States. It was a long day of travel and a difficult goodbye to some really great people who made these last two weeks special! This morning, I made it to bird watching, around 5:30 am. I drank some instant coffee and listened to the chorus of birds that had become familiar. We had beans and fry jack and plantain for breakfast, a meal I know I will soon miss. As we said goodbye to Las Cuevas, three beautiful scarlet macaws swooped over the clearing. Extra poetic. I didn’t see any bees today, but I did say goodbye to the stingless bee colony at Las Cuevas that I’ve been periodically checking these past days. I wish them the best of luck with their pollen-collecting endeavors. 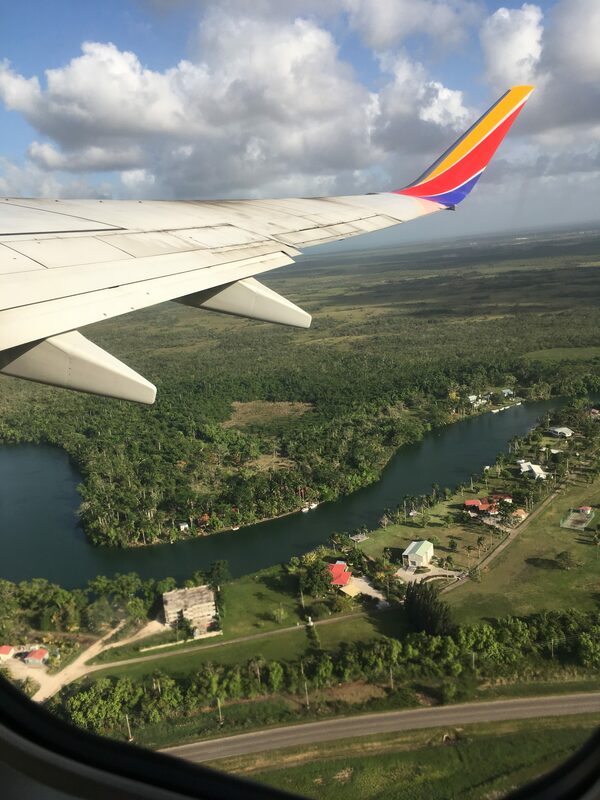 After a delicious, and big, lunch at Cheers near the Belize Zoo, we boarded a plane and waved out the window at beautiful Belize. It was a pretty unbelizable trip. 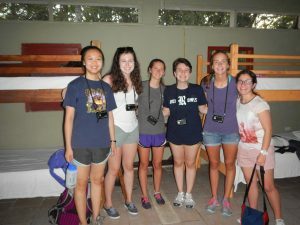 DAY 14 – We are approaching our final hours in Belize. The past two weeks have gone by really fast. Tomorrow night, we will be in Houston. Starting this morning, we retraced our steps and collected the camera traps set out on Day 11. 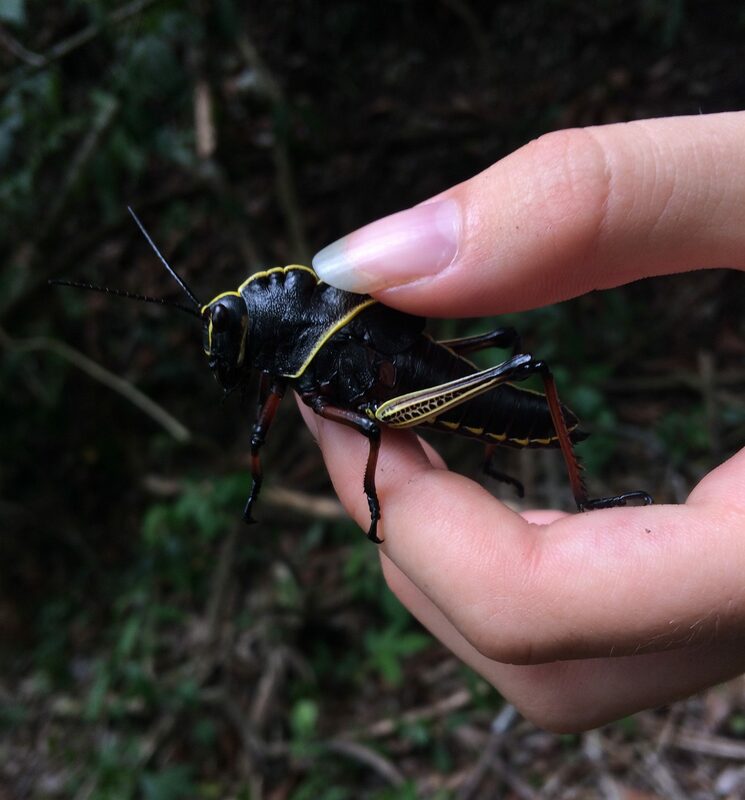 While we were hiking through the forest, I saw a few Western Lubber Grasshoppers (pictured below) and a bug that looked like cookies and cream ice cream. I saw an orchid bee today!! Just in time. It was hovering around by the classroom at the research station. I’m convinced that it was attracted to my fragranced filter paper. It didn’t land, or stick around for long, so I wasn’t able to identify it beyond the tribe Euglossini. I also saw a couple of stingless bees (possibly Trigona fulviventris) out on the trail, fliting from flower to flower. We looked through the memory cards of all 14 camera traps. *drumroll* We got stuff! We got TWO ocelots, a bunch of pacas, some peccaries, a curassow, a deer, and a butterfly. We also got some quality shots of ourselves. It was easily worth the sweaty hiking through dense, off-path forest. My total tick count is now 18, which is kind of horrifying. I’m looking forward to a full body cleanse when I get home. DAY 13 – Today we set the bar high for future EBIO 319 classes by having two lectures in the twilight/dark zone of a cave and another at the top of a bird observation tower overlooking the Chiquibul forest. This morning we collected our pee traps and spent our time until lunch sorting and categorizing by morpho-species the arthropods that had fallen into our pitfall traps. Our data suggests that there is greater nutrient availability on the forest floor and greater arthropod diversity in the canopy. In the early afternoon we were able to explore the cave near the station clearing. You could clearly see the modifications the Maya made to the cave, including alter-like structures covered in plaster and constrictions of openings. We saw a cave cricket, and a helmeted iguana at the entrance to the cave. On our way out, we saw a snake slithering up the wall. I’m becoming a big fan of caves. In terms of bees, today was a pretty empty day. 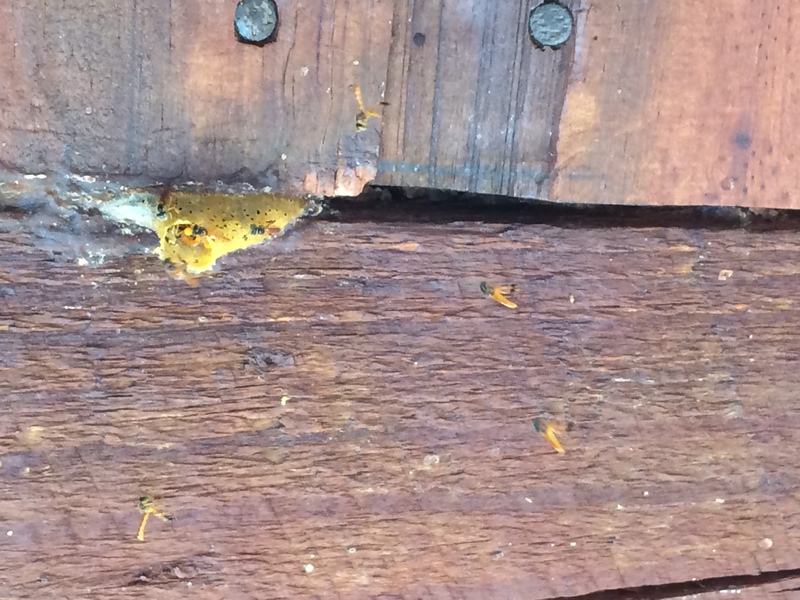 I checked in on the colony on the corner of the research station, which is some sort of stingless bee. Tomorrow, when we retrieve the camera traps, I’m planning on carrying the filter paper for the entire hike. It’s my last chance to see an orchid bee! To finish off a good day, we hiked up a steep hill to a bird observation tower. The view was incredible. Therese talked to us about her research and her experiences as a graduate student which was really cool, especially because the sun was setting over the mountains behind her. To get back to LCRS, we took a short night hike through the forest. We saw some gnarly bugs, like a huge cockroach with a sticky rear end and a longhorn beetle. We also saw a scorpion that was phosphorescent underneath a purple light. I’m glad we packed a lot into today, time is running short! DAY 12 – We got a couple of extra hours of sleep last night, which felt really good. I started the day with a little bit of bird watching. We saw a Red-Lored Parrot, with a green body and red markings on its crown. After breakfast, Scott handed each of us two unexplained vials and told us to hydrate. Little did we know, we would be asked to pee in the vials for our next experiment. 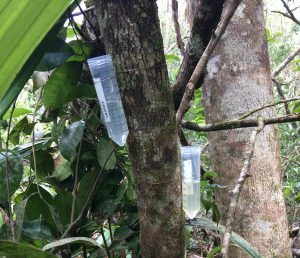 In an effort to compare the arthropod diversity and nutrient availability in the canopy of the rainforest and the forest floor, we set out some pitfall traps. 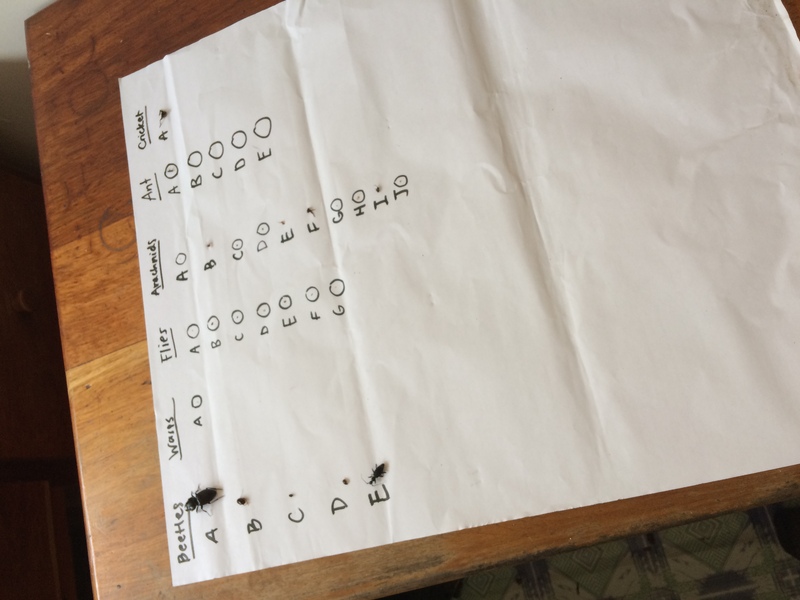 Basically, we are trying to see how many arthropods total we count in our canopy traps (both water and urine) and the floor traps (both water and urine) for a comparison of arthropod diversity. 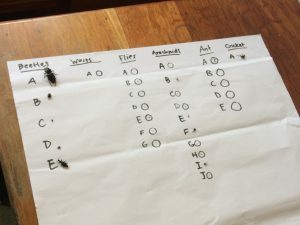 We can also infer nutrient availability by the difference between arthropods who go into the urine traps (which have high nutrients, including nitrogen) and the water traps. More arthropods in urine traps indicates lower nutrient availability. We had some free time before lunch and presentations before we began our afternoon activity. Scott took us to a young leaf-cutter ant colony (about 1 year old), a slightly older colony (between 3 and 6 years old), and a huge, mature colony (anywhere from 10 to 25 years old). He bravely cut into all three with a shovel and exposed the channels under the soil as well as the fungi that the ants cultivate. 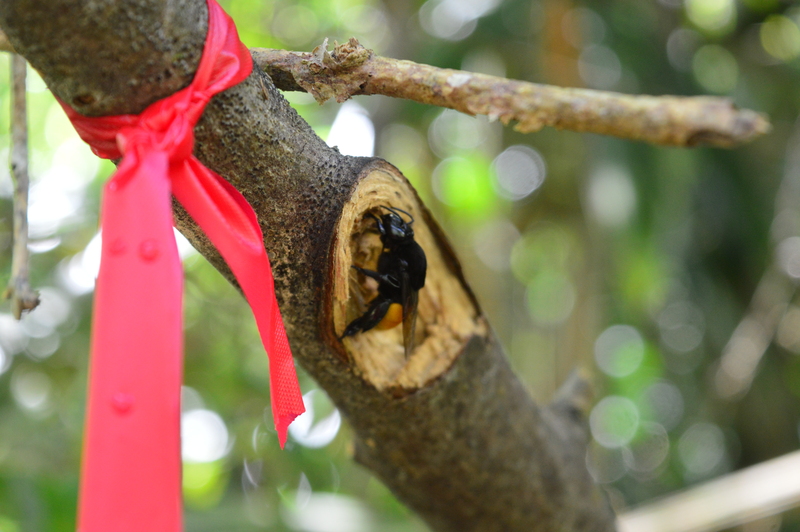 I didn’t see any bees today (except for the nests of stingless bees that are scattered around the research station). I’m going to double down on my efforts to attract a male orchid bee by carrying my fragranced filter paper. We saw seven Scarlet Macaws total today around the clearing! They are incredibly bright and have kind of a silly squawk. It’s easy to see why they are targets of poaching, given their majestic, colorful plumage. Tomorrow is our second to last day at Las Cuevas. It’s all happening so fast! DAY 11 – Today was a full day. I woke up when it was still dark outside, at 4:45 am. I rolled into my field clothes, the ever-stylish zip-off pants tucked into socks, and out onto the deck for bird-watching. We saw a couple of parrots, flying in a pair across the clearing, a Plumose Kite in a tree preening, and a Social Flycatcher on the research station railing. I want to see at least one Scarlet Macaw before we leave here. After breakfast, Tian-Tian showed me a buzzing group of bees on the corner of the main research station building. They appeared to be stingless bees, in the tribe Meliponini. They might be Trigona fulviventris. I caught one, so if we have a chance I can look at it under a microscope. The bees were all bringing pollen, which you could see attached to their hind tibia, into their nest. Our task for the day was to design an experiment, using camera traps to answer a question about the Chiquibul forest ecosystem. We chose to look at the presence of large cats and large cat prey in both on-path and off-path locations. We spent the whole day, from 9:45 am to 1:15 pm and again from 2:15 pm to 7:15 pm, hiking around and setting camera traps. As we were placing our last camera trap, the sun was setting so we hurried back, hiking the last 30 minutes in the dark. 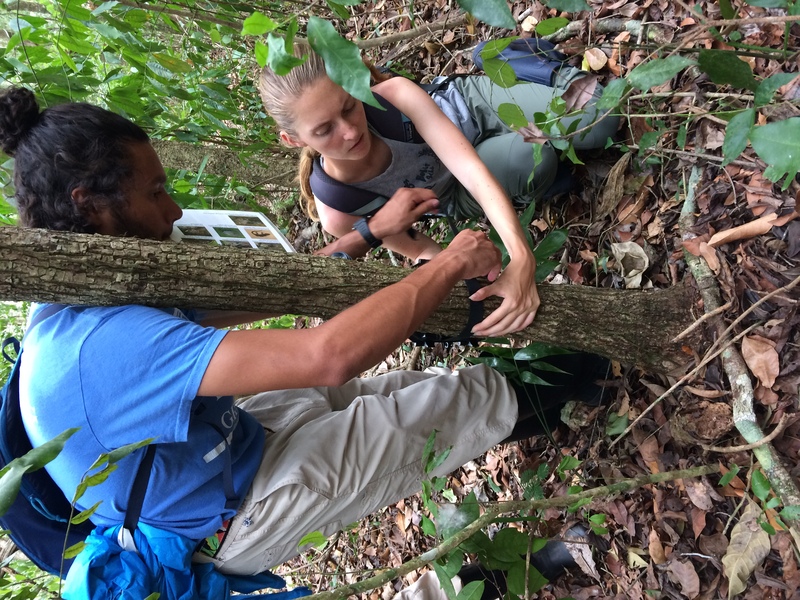 We will collect the camera traps and analyze the results on the last day here at Las Cuevas. Some other highlights from today: eating a termite (it tasted like a root vegetable), seeing a Tommygoff when we were walking back to the station in the dark (the tommygoff is the most venomous snake in Belize), and taking a cold shower after soaking my shirt in sweat. My tummy is full and my legs are tired, and I’m so ready to sleep. DAY 10 – We finally made it to Las Cuevas Research Station! It’s nice and calm here, not too hot today (it’s been raining in the area). This morning we left Crystal Palace around 8:40 am and drove to a swimming area, the Rio On pools. It was a beautiful site, which seemed to be in the middle of nowhere. We explored multiple pools, connected by waterfalls, slipping and scooching on rocks covered in algae. The water was so refreshing, and we dried quickly in the sun. We were supposed to only spend 30 minutes at the swimming pools, but we ended up enjoying ourselves for an hour. 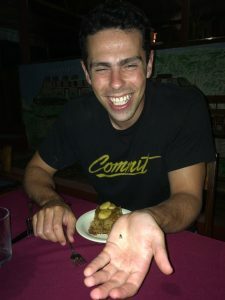 While we were standing around drying off and postponing our departure, Isaac shared his Sour Sop fruit, which he bought at the outdoor market in San Ignacio yesterday. It was a hit. I thought it tasted like mango Hi-Chew candy. We resumed our drive which took us through multiple distinct regions, which contained unique flora. The Caribbean pine was populous until we entered the Lowland area, which is where Las Cuevas is located, and the vegetation changed. We entertained ourselves with cards in the van until we eventually emerged into a large clearing in the rainforest: Las Cuevas. We wasted no time and went on a short hike on the nearby Maya Trail. We made it to Las Cuevas! Damien is excited! We saw a huge Ceiba tree with a couple vultures perched up high and teardrop shaped nests hanging from the branches. 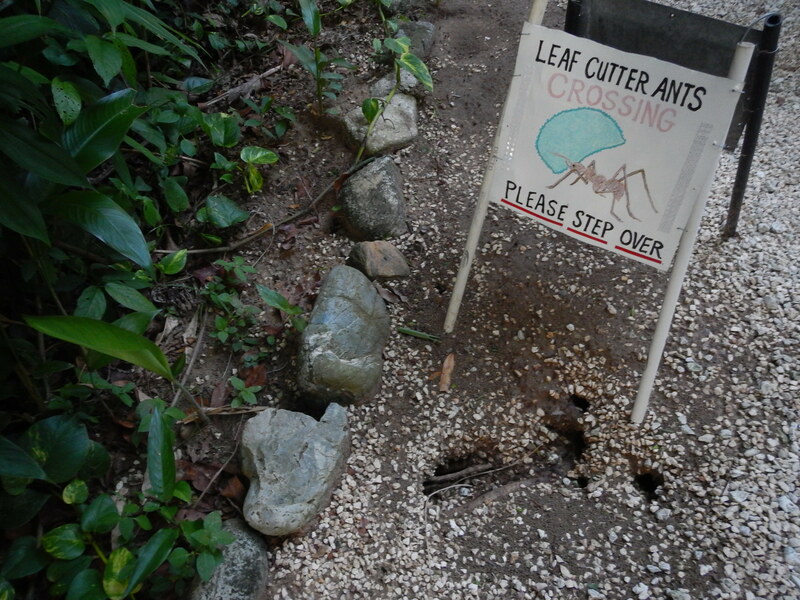 We saw a huge leaf cutter ant colony, which Scott fearlessly kicked to agitate some soldier ants. We saw the Xaté palm, which is a popular palm in the floral market (in the US, UK, Australia, Japan, and more) and is often illegally extracted by Guatemalans to be sold. We saw the Sapodilla, or Chicle, tree which was recognizable by giant slashes where knives had cut the trunk to collect the sap. We ran into a large mound of earth, which we learned was the remains of a Mayan temple. There were two large temples across what was formerly a plaza. Nearby, there were the remains of a ball court. I love how much we get to see and explore related to the Maya civilization. I didn’t see any bees today, unfortunately. Tomorrow, while we hike through the rainforest, I hope to see some bees. I especially want to see an orchid bee (Euglossini tribe). I’m waking up tomorrow morning for 5 am bird-watching, so the sooner I sleep the better! Goodnight! DAY 9 – The main event of today, a visit to the ATM cave, exceeded my expectations. We left TEC around 8:00 am after a sad goodbye to Adrienne. She will be missed. Nelson drove us skillfully down the bumpy gravel roads to Actun Tunichil Muknal (or ATM) Archaeological Reserve. The trail through the forest to the entrance of the cave started off strong: we all waded across water up to our necks, which left us refreshed for the hike ahead. Along the path, our guide showed us the destruction that remained from a hurricane last August. He pointed out some debris about 12 feet off the ground where the water reached. We waded across more sections of the river, finally arriving at the cool, dark opening of the cave. The cave is formed mostly from limestone, some dolomite, and has lots of calcite deposits. We walked/waded through various depths of (chilly) water, surrounded by beautiful rock formations. There were plenty of stalagmites, stalactites, and curtain formations to go around. I was shocked at how extensive the cave was; I could have walked around and explored all day. Our guide told us a lot about the ancient Mayan people who had used the cave between 700 and 950 AD. Mayans believed caves were connected to the underworld, and so very few people actually entered the caves. Priests and their entourage would go into the cave to perform sacrifices, including blood-letting. The Mayan people would cut themselves with obsidian blades or sting ray barbs and drip their blood onto paper to be burned. In order to appease the gods, or to ask for their favor, various sacrificial acts would be performed. In some cases, human sacrifice was performed inside the caves. We saw remains from 5 bodies in the cave, the last of which has been dated back to 950 AD, right before the collapse of the Mayan civilization. Sacrifice was seen as an honor, and those who were sacrificed to the gods skipped the nine trials of the underworld and went straight to the upper world. In the big, cavernous rooms of the underground cave, there was also lots of scattered ceramic pieces. There were boards for grinding corn and cacao, lots of vessels, and remnants of fire pits. It’s crazy that the artifacts survived for so long. According to our guides, they are most likely exactly as the Mayans left them. I could go on and on about the cave, but I want this blog post to be brief and I also have bees to talk about! As we emerged from the cave, it began to pour in the forest, which was really cool. We were already soaked from the cave water and river water, so more water couldn’t hurt us at all. We ate lunch and drove to San Ignacio, where we walked around a little bit. Sarah and I found a bathroom (for free!) thanks to a nice waiter at a restaurant in the city. I also tried an apple banana, courtesy of Scott. It was a tiny little bugger, and really sweet. Finally, the moment you’ve been waiting for, the bee. We drove from San Ignacio to Crystal Palace Eco-lodge where I saw my first confirmed sweat bee. There were three in total, walking around on the table. They are in the Halictini tribe, and are small and black all over. We head into the rainforest tomorrow! Wish us luck! DAY 8 — Leaving Glover’s Reef was sad, but so far so good on land! We left Middle Caye at 8:00 am sharp and headed to Carrie Bow Caye. There we met Clyde, who is a volunteer station manager for the Smithsonian research station, who was generous enough to show us around. 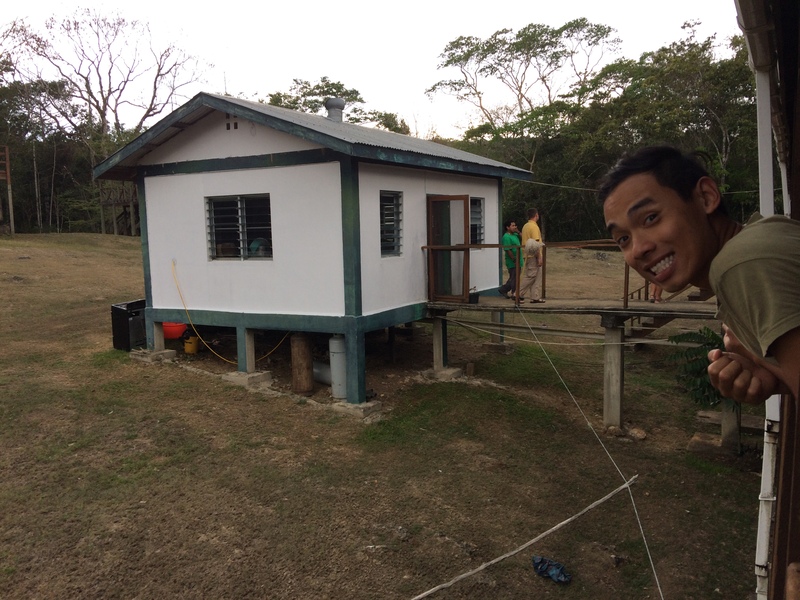 It was cool to see another research station, similar to the WCS facility on Middle Caye at Glover’s. Another quick boat ride took us to Twin Caye, where we had our last romp in the water. We saw a manatee on the way, which was a fun treat. We walked through some mangrove peat among the red mangroves, which was mucky and wet, but a lot of fun. Then we suited up for a final snorkel among the mangrove roots. There were many, many sponges growing among the roots of the mangroves. Lots of encrusting sponges grow on the roots and are able to get more nutrients that way. I saw the encrusting Orange Icing Sponge (Mycale laevis) and many other kinds of sponges, but I had some difficultly identifying them. I also saw lots of jellyfish, a juvenile spotted ray, and lots of juvenile fishes. Therese spotted and caught a tiny yellow seahorse. It was crazy to see a seahorse in real life. We completed our journey back to TEC, saying goodbye to Javier and Adolfo. Before dinner, we squeezed in some hiking around the trails at TEC. I had a possible sweat bee sighting (Halictini tribe) but didn’t really get a good look. 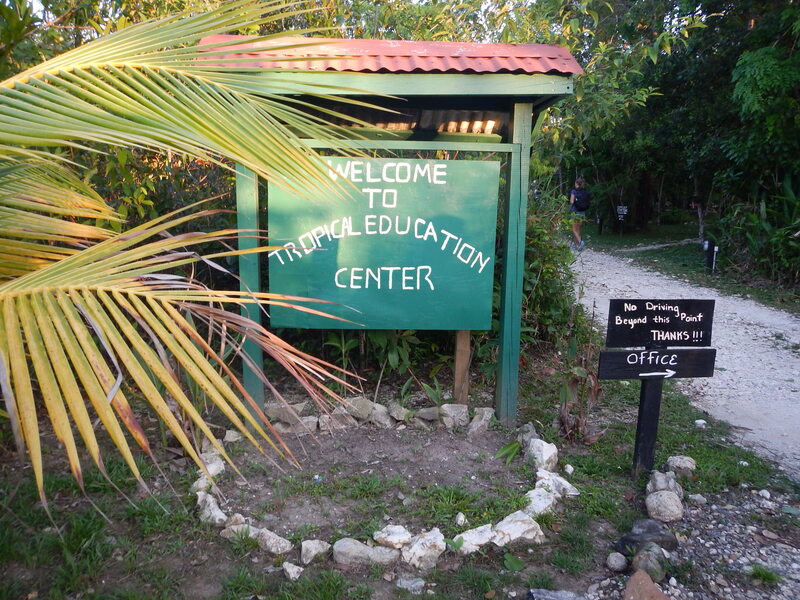 The highlight of the day for me was our night tour of the Belize Zoo. It was easily the best zoo experience I have ever had. They only keep native species, and their enclosures are as close as possible to natural, untouched, Belize vegetation. Most of the animals were rescued or confiscated from people keeping them illegally and very few were captured from the wild. I got to feed a Tapir, named Indie, which was a dream come true. I loved his little snout snuffling at and crunching on carrots and lettuce. We also saw nocturnal opossums, pacas (who happily chomped at the bananas we gave them), an ocelot, a cougar, and a jaguar named Junior who did somersaults in exchange for food. We saw a few species of owl: a spectacled owl, a barn owl, and a pygmy owl. We also saw a frigate bird, named Molly, who had lost an eye and the ability to fly. She had been fashioned little “shoes” because her feet are not used to standing so much. At the end of the tour, we each got a chance to hold a boa constrictor. Five stars for the Belize Zoo. Finally, an EBIO 319 alumnus (Lucretia) happened to be at TEC the same night as us. 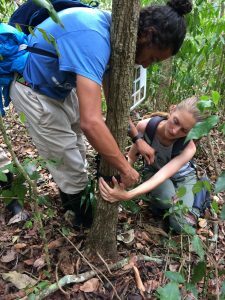 She is back in Belize this summer working with jaguars. She talked to us about her time as a TFB and then as an independent researcher during study abroad in Tanzania. It was cool to hear about what she had done, how EBIO 319 had inspired her, and what she plans to do next. Tomorrow we have another early morning and another busy day! 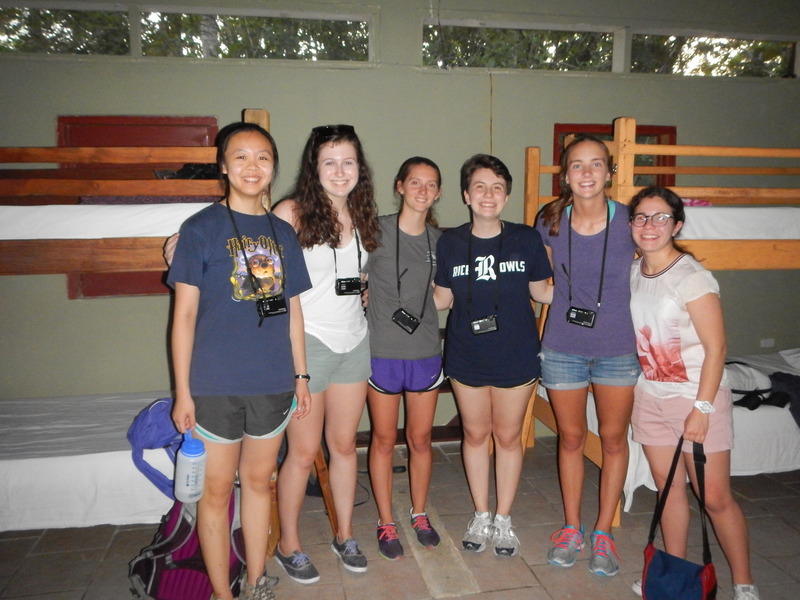 DAY 1 — We met this morning, bright eyed and bushy tailed at 10:30am. By noon, we were waiting in the security line at Hobby. By 1:45, after a quick bite, we boarded our plane and took off! Looking out the plane window during our descent, I began to get a sense of Belize. I could see the bright blue coast, large expanses of lush green, expanses of brown, and, nearer to the airport, brightly colored homes. Leaving the airport in our van, we got a little taste of Belize City, with its colorful buildings and big, bold Belikin advertisements. We stopped at Low’s general/grocery store for snack-age (I got some plantain chips and wheat biscuits). The drive to TEC (Tropical Education Center) was beautiful, the sun was low in the sky. When we arrived around 6pm, we were greeted by a procession of leaf cutter ants (see below) and a delicious meal (beans and rice, plantains, banana bread, etc). Hard to see here, but there were leaf cutter ants crossing, I promise! No bee sightings today. I’ll keep my eyes peeled. No sponge sightings either (surprise, surprise). Hopefully, I’ll see some sponges tomorrow, our first day on the reef. We did see a cool, calm, and collected green iguana teetering on a skinny little branch at the top of a tree, eating leaves. We also had a little frog friend in the cabin. I’m really looking forward to the boat ride to Glover’s tomorrow. Sunscreen will be applied amply (don’t worry, dad).